A few weeks ago I was contacted by a young man who made me an enticing proposition. No, not that kind! Even better. Jeffrey Orlick, Queens Qustodian, was orchestrating a food event on Christmas eve, an event for "lonely Asians and Jews" who did not celebrate Christmas. He called it Woks and Lox, dinner for 20 and a party for 40, held at the Queens Kickshaw, a brick-wall-and-wooden-table hipster cafe in Astoria. He had seen my name on the internet and wondered if I could talk some friends into playing mahjongg at the event in exchange for a free dinner. Could I! We arrived at 5 p.m. and unobtrusively set up our table. We played through the arrival of the guests and stopped only when the wait staff served us course after course. 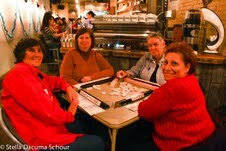 The chef posted the menu here: Woks and Lox dinner menu and we will forgive her for saying that she made extra for the "little old Jewish ladies playing mahjongg". Do we look like little old Jewish ladies? It was all so interesting and delicious - kasha varnishkes with ginger and scallions, red bean paste rugelach. And it was so cute the way the waitress said var-NISHkas. We even got gelt, which I put in my mahjongg purse for when I go pie. Maybe I will call it going chocolate. I'm planning on buying a new set this year. Do you have a favorite color combination? Please leave a comment here or on the Facebook fan page. This is my set now. Pink tiles with black racks. I'm thinking peaches and cream with wooden racks. I'm not all that crazy about the "pushers"
Maybe clear racks? It's an agonizing decision! 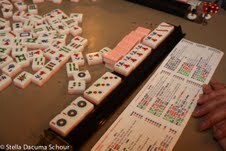 But here is wishing you all a happy mahjongg new year. May you all be winners! 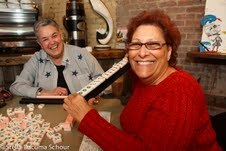 We of a certain age know what the Charleston is, but what is the etymology as far as its relationship to mahjongg? Does anyone know? Does anyone care? Here is my hypothesis: Mahj was at the peak of its popularity in the 1920s, and the Charleston, of course, was the popular dance of the day. If you watch people doing the dance you will see they place their right foot across the left leg and then the left leg across the right. Sound familiar? Of course. Now, in theory passing sounds easy, but practice can prove otherwise. First right is probably the easiest, since you've put all your pairs together, looked for families, done all the right things and can easily select three orphans that you want to dump on your opponents. You can afford to be a little reckless here, since it's anyone's guess as to what tiles are in play. First across is a little more difficult. At this point you will be evaluating incoming information and honing the hand. If you don't have a definite direction, this is the time to find one, no matter how weak it may be. 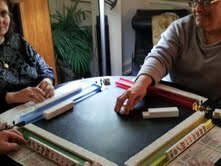 Mahjongg is about decision making, being firm and precise. A tile passed on the first across can come back to you on the second left, allowing you to draw some preliminary conclusions about the hands of others. First left gives you the first opportunity to steal, but only do so if you are squeezed. Often times a steal will backfire, leaving you no better than you were before the pass. Keep in mind a tile you pass on the first left can come back to you on the option. Once you receive your first left stop and re-evaluate before passing the second left. Second Left begins the second Charleston and is done only if no one has expressed a desire to stop the passing. Ideally as the tiles are passed, players should state which pass is taking place. State "Right" and then place the tiles to the right, "Across" and then "First Left." The Second Left is differentiated by stacking one tile atop the other two like a cap or "little house". Chatting should be kept to a minimum during passing, as it is easy to be distracted. Keep track of where you are or there will be trouble down the road! Must across is just as it sounds. You must pass three tiles across. I sometimes whimsically refer to it as the Mustard Cross since I like the sound of those two words together and it creates and interesting visual. But cross you must. If you get back on the second left the same tiles you passed on the first across, just pass them across again. But if you got something good on the second left you may be reluctant to make this pass. If you do pass away a needed tile, be prepared to kiss it goodbye and make your adaptations. What's wrong with this picture? Answer below. Last Right a/k/a last rites, is your last chance to get your house in order. At this stage you should have a strong inkling of what hand you are going for, and a plan B in place in case things don't pan out. You should not be surprised at what tiles get thrown out in the first few sets of discards, as they will have made their appearance a couple of times in the passing. Call your bettor over before you do the option. Option is usually a futile effort, and it is rare you will see anything new; just the same old right-side-of-the-rack debris. Let the bettor see what you got and then start your play. Answer to quiz: The player is picking up her across before her second left! This will lead to one player having too many tiles while another has too few. Avoid squabbles and do not pass your across until you see the second left has been taken. Last word: Another common cause of screwups is short walls being mistaken for passes. Make certain that if you have a wall that ends up with three or fewer tiles that it is added to the next wall so it does not inadvertently get picked up. If a screwup occurs before East discards, the proper remedy is to throw all the tiles in and start again, which is no fun especially if you have a decent hand.